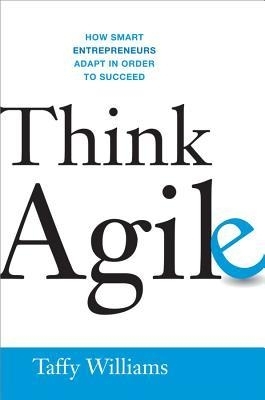 “Think Agile – How Smart Entrepreneurs Adapt in Order to Succeed” by Taffy Williams (Amacom, $23). Despite believing they’re flexible, entrepreneurs often rely on their strengths when faced with opportunities and problems. Such reliance makes their actions and reactions predictably one-dimensional. Many entrepreneurs believe they’re risk-takers — after all there’s a huge risk in starting a business. Yet, as their business grows, their view of risk changes. They begin to fear failure. And, when crunch time comes, they become overly cautious. That fear creates a rigid, narrowly-focused approach to doing business. Then there are entrepreneurs who are so emotionally attached to their ideas and plans that they won’t listen to others. If you’ve watched any episode of “Shark Tank,” you’ve seen newbie business owners staunchly defending their approaches, products and services with an “I know better” attitude. Their commitment to their path leaves many stones unturned. What do all of these entrepreneurs have in common? A self-imposed blind spot. Agile entrepreneurs, on the other hand, recognize that they don’t know what they don’t know. They seek advice and listen to it. They constantly ask questions about how to approach situations. They understand that rushing headlong into something usually creates problems because plans aren’t thought through. They know playing “not to win” is a loser’s game. They also know that the customer, not the commitment of the entrepreneur, makes or breaks a business. Doing so allows them to “plan for the unexpected and prepare for the unpredictable.” While there’s value in goals, budgets, timeframes, etc., there are too many events over which they have no control. These require adaptive responses. Agile entrepreneurs “see their plan as a malleable document that can and should be adjusted.” Williams doesn’t talk just about what-if Plan B’s. He encourages entrepreneurs to create Plans C, D, E … . By thinking ahead, they can visualize future adjustments. For continuing advice, check out Williams’s “Startup” blog at taffywilliams.blogspot.com. 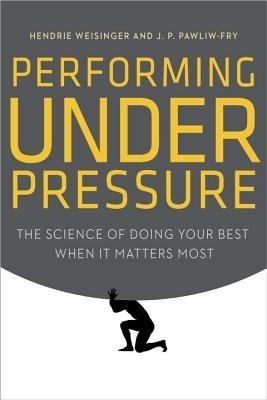 “Performing Under Pressure: The Science of Doing Your Best When It Matters Most” by Hendrie Weisinger and J.P. Pawliw-Fry (Crown Business, $26). The Queen song “Under Pressure” (featuring David Bowie) aptly describes the feeling of self-pressurization: “Chippin’ around, kick my brains ’round the floor. These are the days — it never rains but it pours.” The authors’ study of more than 12,000 people shows that although pressure debilitates performance, there are 22 self-depressurization steps. “Befriend the moment” – Feeling challenged, rather than threatened, “is an inherent performance steroid,” which generates the adrenaline needed to jumpstart action. People who want to take the game-winning shot thrive on the challenge of pressure situations. They may miss the shot; Pro Basketball Hall of Famer Michael Jordan missed 26 potential game-winning shots, but always wanted the ball when the game was on the line. “Downsize the importance” – Pressure distorts perception. The higher degree of importance you place on something, the more pressure you’ll feel. When that happens, emotion creates cognitive dissonance. Judgment and decision-making are compromised. Depressurize your situation by literally thinking “No big deal.” That may be easier said than done when the boss tells you of its importance, but treating the situation like any other lets you reframe your mindset. “Focus on the mission” – Stay clear on what needs to be accomplished. But don’t focus on outcome. If you do, you’ll drag emotion into the situation because you’ll be thinking about consequences. Before reading the book, take the “Weisinger Pressure Assessment and Inventory” in Appendix B. Your answers provide context to the content.